Purpose To set limits on government actions in regard to personal liberties. The amendments were introduced by James Madison to the 1st United States Congress as a series of legislative articles. They were adopted by the House of Representatives on August 21, 1789, formally proposed by joint resolution of Congress on September 25, 1789, and came into effect as Constitutional Amendments on December 15, 1791, through the process of ratification by three-fourths of the States. While twelve amendments were proposed by Congress, only ten were originally ratified by the states. Of the remaining two, one was adopted 203 years later as the Twenty-seventh Amendment and the other technically remains pending before the states. Originally, the Bill of Rights implicitly legally protected only white men, excluding American Indians, people considered to be "black" (now described as African Americans), and women. These exclusions were not explicit in the Bill of Rights' text, but were well understood and applied. freedom from fines and forfeitures without trial. The government should not have the power of suspending or executing laws, "without consent of the representatives of the people,". A legal defendant has the right to be "confronted with the accusers and witnesses, to call for evidence in his favor, and to a speedy trial by an impartial jury of his vicinage," and may not be "compelled to give evidence against himself." Individuals should be protected against "cruel and unusual punishments", baseless search and seizure, and be guaranteed a trial by jury. The government should not abridge freedom of the press, or freedom of religion ("all men are equally entitled to the free exercise of religion"). The government should be enjoined against maintaining a standing army, and that a "well regulated militia, composed of the body of the people, trained to arms, is the proper, natural, and safe defense of a free state." Prior to the acceptance and implementation of the United States Constitution, the original 13 colonies followed the stipulations and agreements set forth in the Articles of Confederation, created by the Second Continental Congress and ratified in 1781. The national government that operated under the Articles of Confederation was too weak however to adequately regulate the various conflicts that arose between the states. The Philadelphia Convention set out to correct weaknesses inherent in the Articles of Confederation that had been apparent even before the American Revolutionary War had been successfully concluded. The newly constituted Federal government included a strong executive branch, a stronger legislative branch and an independent judiciary. The Bill of Rights enumerates freedoms not explicitly indicated in the main body of the Constitution: freedom of religion, freedom of speech, a free press, free assembly, and free association; the necessity of a well-regulated militia for the security of a free state, the right of the people to keep and bear arms; freedom from unreasonable search and seizure, security in personal effects, freedom from warrants issued without probable cause; indictment by a grand jury for any capital or "infamous crime", guarantee of a speedy, public trial with an impartial jury composed of members of the state or judicial district in which the crime occurred, and prohibition of double jeopardy. In addition, the Bill of Rights reserves for the people any rights not specifically mentioned in the Constitution and reserves all powers not specifically granted to the federal government to the people or the States. Most of these enumerated freedoms under the federal Constitution were later applied to the states by a series of legal decisions using the due process clause of the Fourteenth Amendment, which was ratified in 1868. The Bill was influenced by George Mason's 1776 Virginia Declaration of Rights, the English Bill of Rights 1689, works of the Age of Enlightenment pertaining to natural rights, and earlier English political documents such as Magna Carta (1215). Following the Philadelphia Convention, some famous revolutionary figures and statesmen, such as Patrick Henry, publicly argued against the Constitution. Many were concerned that the strong national government proposed by the Federalists was a threat to individual rights and that the President would become a king, and objected to the federal court system in the proposed Constitution. Thomas Jefferson, at the time serving as Ambassador to France, wrote to Madison advocating a Bill of Rights: "Half a loaf is better than no bread. If we cannot secure all our rights, let us secure what we can." George Mason refused to sign the proposed Constitution, in part to protest its lack of a Bill of Rights. The United States Constitutional Convention (also known as the Philadelphia Convention, and various other names) took place from May 14 to September 17, 1787, in Philadelphia, Pennsylvania. Although the Convention was purportedly intended only to revise the Articles of Confederation, the intention from the outset of many of its proponents, chief among them James Madison and Alexander Hamilton, was to create a new government rather than fix the existing one. Due to the difficulty of travel in the late 18th century, very few of the selected delegates were present on the designated day of May 14, 1787, and it was not until May 25 that a quorum of seven states was secured. The convention convened in the Pennsylvania State House, and George Washington was unanimously elected as president of the convention and William Jackson was elected as secretary. Madison's Notes of Debates in the Federal Convention of 1787 remain the most complete record of the convention. In late July 1787, the convention appointed a Committee of Detail to draft a document based on the agreements that had been reached. After another month of discussion and refinement, a second committee, the Committee of Style and Arrangement, headed by Gouverneur Morris, and including Hamilton, William Samuel Johnson, Rufus King, and Madison, produced the final version, which was submitted for signing on September 17. Morris is credited, both now and then, as the chief draftsman of the final document, including the preamble. Delegates to the Philadelphia Convention on September 12, 1787, debated whether to include a Bill of Rights in the body of the U.S. Constitution, and an agreement to create the Bill of Rights helped to secure ratification of the Constitution itself. Ideological conflict between Federalists and anti-Federalists threatened the final ratification of the new national Constitution. Thus, the Bill addressed the concerns of some of the Constitution's influential opponents, including prominent Founding Fathers, who argued that the Constitution should not be ratified because it failed to protect the fundamental principles of human liberty. The Constitution was then submitted to the states for ratification, pursuant to its own Article VII. Twelve articles were proposed to the States, but only ten, corresponding to the First through Tenth Amendments, were ratified in the 18th century. The first Article, dealing with the number and apportionment of U.S. Representatives, has never been ratified, and the second, limiting the power of Congress to increase the salaries of its members, was ratified in 1992 as the 27th Amendment. The 55 delegates who drafted the Constitution included many of the Founding Fathers of the new nation. Thomas Jefferson, who was Minister to France during the convention, characterized the delegates as an assembly of "demi-gods." John Adams also did not attend, being abroad in Europe as Minister to Great Britain, but he wrote home to encourage the delegates. Patrick Henry was also absent; he refused to go because he "smelt a rat in Philadelphia, tending toward the monarchy." Also absent were John Hancock and Samuel Adams. Rhode Island refused to send delegates to the convention. Madison's "Notes for speech on Constitutional amendments, June 8, 1789, in which he underlined the concept of "natural rights retained"
To some degree, the Bill of Rights (and the American Revolution) incorporated the ideas of John Locke, who argued in his 1689 work Two Treatises of Government that civil society was created for the protection of property (Latin proprius, or that which is one's own, meaning "life, liberty, and estate"). Locke also advanced the notion that each individual is free and equal in the state of nature. Locke expounded on the idea of natural rights that are inherent to all individuals, a concept Madison mentioned in his speech presenting the Bill of Rights to the 1st Congress. Locke's argument for protecting economic rights against government may have been most salient to the framers of the Amendments; quartering and cruel punishments were not the current abuses of 1791. For while we feel all these inducements to go into a revisal of the constitution, we must feel for the constitution itself, and make that revisal a moderate one. I should be unwilling to see a door opened for a re-consideration of the whole structure of the government, for a re-consideration of the principles and the substance of the powers given; because I doubt, if such a door was opened, if we should be very likely to stop at that point which would be safe to the government itself: But I do wish to see a door opened to consider, so far as to incorporate those provisions for the security of rights, against which I believe no serious objection has been made by any class of our constituents. I believe that the great mass of the people who opposed [the Constitution], disliked it because it did not contain effectual provision against encroachments on particular rights, and those safeguards which they have been long accustomed to have interposed between them and the magistrate who exercised the sovereign power: nor ought we to consider them safe, while a great number of our fellow citizens think these securities necessary. Madison's proposed amendments were presented as Nine Articles comprising up to 20 Amendments. Madison's proposal was reworked and adopted as 17 Amendments by the House of Representatives on August 21, 1789, and forwarded to the Senate on August 24. The House version rejected Madison's idea to incorporate the amendments into the body of the Constitution and instead submitted its 17 Articles to be attached separately "in addition to, and amendment of, the Constitution." The Senate edited the House's proposed 17 Amendments and adopted a version with 12 Amendments. The two versions went to the Joint Committee and the Senate's version became the one adopted by joint resolution of Congress on September 25, 1789, to be forwarded to the states on September 28. Bills of rights are in their origin, stipulations between kings and their subjects, abridgments of prerogative in favor of privilege, reservations of rights not surrendered to the prince. Such was "Magna Charta", obtained by the Barons, swords in hand, from King John. Thomas Jefferson was a supporter of the Bill of Rights. George Mason "wished the plan [the Constitution] had been prefaced with a Bill of Rights." Elbridge Gerry of Massachusetts "concurred in the idea & moved for a Committee to prepare a Bill of Rights." Roger Sherman argued against a Bill of Rights stating that the "State Declarations of Rights are not repealed by this Constitution." Mason then stated "The Laws of the U.S. are to be paramount to State Bills of Rights." Gerry's motion was defeated with 10-Nays, 1-Absent, and No-Yeas. In Massachusetts, the Constitution ran into serious, organized opposition. Only after two leading Anti-federalists, Adams and Hancock, negotiated a far-reaching compromise did the convention vote for ratification on February 6, 1788 (187–168). Anti-federalists had demanded that the Constitution be amended before they would consider it or that amendments be a condition of ratification; Federalists had retorted that it had to be accepted or rejected as it was. Under the Massachusetts compromise, the delegates recommended amendments to be considered by the new Congress, should the Constitution go into force. The Massachusetts compromise determined the fate of the Constitution, as it permitted delegates with doubts to vote for it in the hope that it would be amended. Massachusetts' Rufus King assessed the Convention as a creature of the states, independent of the Articles Congress, submitting its proposal to Congress only to satisfy forms. Though amendments were debated, they were all defeated, and on September 28, 1787, the Articles Congress resolved "unanimously" to transmit the Constitution to state legislatures for submitting to a ratification convention according to the Constitutional procedure. Several states enlarged the numbers qualified just for electing ratification delegates. In this they went beyond the Constitution's provision for the most voters for the state legislature to make a new social contract among, more nearly than ever before, "We, the people". Following Massachusetts' lead, the Federalist minorities in both Virginia and New York were able to obtain ratification in convention by linking ratification to recommended amendments. A minority of the Constitution's critics continued to oppose the Constitution. Maryland's Luther Martin argued that the federal convention had exceeded its authority; he still called for amending the Articles. Article 13 of the Articles of Confederation stated that the union created under the Articles was "perpetual" and that any alteration must be "agreed to in a Congress of the United States, and be afterwards confirmed by the legislatures of every State". However, the unanimous requirement under the Articles made all attempts at reform impossible. Martin's allies such as New York's John Lansing, Jr., dropped moves to obstruct the Convention's process. They began to take exception to the Constitution "as it was", seeking amendments. Several conventions saw supporters for "amendments before" shift to a position of "amendments after" for the sake of staying in the Union. New York Anti's "circular letter" was sent to each state legislature proposing a second constitutional convention for "amendments before". It failed in the state legislatures. Ultimately, only North Carolina and Rhode Island would wait for amendments from Congress before ratifying. Article VII of the proposed constitution stipulated that only nine of the thirteen states would have to ratify for the new government to go into effect (for the participating states). After a year had passed in state-by-state ratification battles, on September 13, 1788, the Articles Congress certified that the new Constitution had been ratified. The new government would be inaugurated with eleven of the thirteen. The Articles Congress directed the new government to begin in New York City on the first Wednesday in March, and on March 4, 1789, the government duly began operations. George Washington had earlier been reluctant to go the Convention for fear the states "with their darling sovereignties" could not be overcome. But he was elected the Constitution's President unanimously, including the vote of Virginia's presidential elector, the Anti-federalist Patrick Henry. The new Congress would be a triumph for the Federalists. The Senate of eleven states would be 20 Federalists to two Virginia (Henry) Anti-federalists. The House would seat 48 Federalists to 11 Antis from only four states: Massachusetts, New York, Virginia and South Carolina. Antis' fears of personal oppression by Congress would be allayed by Amendments passed under the floor leadership of James Madison in the first session of the first Congress. These first ten Amendments ratified by the states were to become known as the Bill of Rights. Objections to a potentially remote federal judiciary would be reconciled with 13 federal courts (11 states, Maine and Kentucky), and three Federal riding circuits out of the Supreme Court: Eastern, Middle and South. Suspicion of a powerful federal executive was answered by Washington's cabinet appointments of once-Anti-Federalists Edmund Jennings Randolph as Attorney General and Thomas Jefferson as Secretary of State. What Constitutional historian Pauline Maier calls a national "dialogue between power and liberty" had begun anew. Four of the next five states to ratify, including New Hampshire, Virginia, and New York, included similar language in their ratification instruments. They all sent recommendations for amendments with their ratification documents to the new Congress. Since many of these recommendations pertained to safeguarding personal rights, this pressured Congress to add a Bill of Rights after Constitutional ratification. Additionally, North Carolina refused to ratify the Constitution until progress was made on the issue of the Bill of Rights. Thus, while the Anti-Federalists were unsuccessful in their quest to prevent the adoption of the Constitution, their efforts were not totally in vain. After the Constitution was ratified in 1789, the 1st United States Congress met in Federal Hall in New York City. Most of the delegates agreed that a "bill of rights" was needed and most of them agreed on the rights they believed should be enumerated. Madison, at the head of the Virginia delegation of the 1st Congress, had originally opposed a Bill of Rights but hoped to pre-empt a second Constitutional Convention that might have undone the difficult compromises of 1787: a second convention would open the entire Constitution to reconsideration and could undermine the work he and so many others had done in establishing the structure of the U.S. Government. Writing to Jefferson, he stated, "The friends of the Constitution...wish the revisal to be carried no farther than to supply additional guards for liberty...and are fixed in opposition to the risk of another Convention....It is equally certain that there are others who urge a second Convention with the insidious hope of throwing all things into Confusion, and of subverting the fabric just established, if not the Union itself." Madison based much of the Bill of Rights on George Mason's Virginia Declaration of Rights (1776), which itself had been written with Madison's input. He carefully considered the state amendment recommendations as well. He looked for recommendations shared by many states to avoid controversy and reduce opposition to the ratification of the future amendments. Additionally, Madison's work on the Bill of Rights reflected centuries of English law and philosophy, further modified by the principles of the American Revolution. On November 20, 1789, New Jersey became the first state to ratify these amendments. On December 15, 1791, ten of these proposals became the First through Tenth Amendments — and U.S. law — when they were ratified by the Virginia legislature. September 17, 1787 – Final draft of the Constitution is signed and convention adjourns. September 28, 1787 – Continental Congress approves sending proposed Constitution to states for their consideration. December 7, 1787 – Delaware is 1st state to ratify the Constitution. December 12, 1787 – Pennsylvania is 2nd state to ratify the Constitution. December 18, 1787 – New Jersey is 3rd state to ratify the Constitution. January 2, 1788 – Georgia is 4th state to ratify the Constitution. January 9, 1788 – Connecticut is 5th state to ratify the Constitution. February 6, 1788 – Massachusetts is 6th state to ratify the Constitution. March 24, 1788 – Rhode Island REFUSES to call ratifying convention. April 28, 1788 – Maryland is 7th state to ratify the Constitution. May 23, 1788 – South Carolina is 8th state to ratify the Constitution. June 21, 1788 – New Hampshire is 9th state to ratify the Constitution. June 25, 1788 – Virginia is 10th state to ratify the Constitution. July 26, 1788 – New York is 11th state to ratify the Constitution. March 4, 1789 – The Constitution goes into effect. September 25, 1789 – Congress proposes Bill of Rights. November 21, 1789 – North Carolina is 12th state to ratify the Constitution. January 25, 1790 – New Hampshire is 5th state to ratify the Bill of Rights, rejected article II. June 7, 1790 – Rhode Island is 9th state to ratify the Bill of Rights. October 17, 1790 – Treaty between New York and Vermont paves way for Vermont's admission to the union. January 10, 1791 – Vermont becomes 14th state to ratify the Constitution — except that it's not a state until March 4, 1791. December 15, 1791 – Virginia is 11th state to ratify the Bill of Rights, approved all and the Bill of Rights goes into effect. March 2, 1939 – Massachusetts ratified the Bill of Rights as part of the Bill of Rights sesquicentennial celebrations. March 24, 1939 – Georgia ratified the Bill of Rights as part of the Bill of Rights sesquicentennial celebrations. April 19, 1939 – Connecticut ratified the Bill of Rights as part of the Bill of Rights sesquicentennial celebrations. Articles III to XII were ratified by 11/14 states (> 75%). Article I, rejected by Delaware, was ratified only by 10/14 States (< 75%), and despite later ratification by Kentucky (11/15 states < 75%), the article has never since received the approval of enough states for it to become part of the Constitution. Article II was ratified by 6/14, later 7/15 states, but did not receive the 3/4 majority of States needed for ratification until 1992 when it became the 27th Amendment. Lawmakers in Kentucky, which became the 15th state to join the Union in June 1792, ratified the entire set of twelve proposals during that commonwealth's initial month of statehood, perhaps unaware that Virginia's approval six months earlier had already made ten of the package of twelve part of the Constitution. Although ratification made the Bill of Rights effective in 1791, three of the original thirteen states — Connecticut, Georgia, and Massachusetts — did not ratify the first ten amendments until 1939, when they were urged to do so in a celebration of the 150th anniversary of their passage by Congress. After the enumeration required by the first article of the Constitution, there shall be one representative for every thirty thousand, until the number shall amount to one hundred, after which the proportion shall be so regulated by Congress, that there shall be not less than one hundred representatives, nor less than one representative for every forty thousand persons, until the number of representatives shall amount to two hundred; after which the proportion shall be so regulated by Congress, that there shall be not less than two hundred representatives, nor more than one representative for every fifty thousand persons. Article II (ratified in 1992 as Twenty-seventh Amendment) – Congressional pay raises. George Washington had fourteen handwritten copies of the Bill of Rights made, one for Congress and one for each of the original thirteen states: Connecticut, Delaware, Georgia, Maryland, Massachusetts, New Hampshire, New Jersey, New York, North Carolina, Pennsylvania, Rhode Island, South Carolina, Virginia. The copies for Georgia, Maryland, New York, and Pennsylvania went missing. The New York copy is thought to have been destroyed in a fire, whereas the Pennsylvania copy reportedly disappeared in the later 18th century. Two unidentified copies of the missing four (thought to be the Georgia and Maryland copies) survive; one is in the National Archives and the other is in the New York Public Library. North Carolina's copy was stolen by a Union soldier in April 1865 and returned to North Carolina in 2005, 140 years later by FBI Special Agent Robert King Wittman. Virginia's copy was used for the Bill of Rights Tour, to mark the bicentennial of the Bill of Rights, in 1991. Originally, the Bill of Rights restrictions applied only to the federal government and not to the state governments. Parts of the amendments originally proposed by Madison that would have limited state governments ("No state shall violate the equal rights of conscience, or the freedom of the press, or the trial by jury in criminal cases.") were not approved by Congress, and therefore the Bill of Rights did not apply to the powers of state governments. States had established state churches up until the 1820s, and Southern states, beginning in the 1830s, could ban abolitionist literature. In the 1833 case Barron v. Baltimore, the Supreme Court specifically ruled that the Bill of Rights provided "security against the apprehended encroachments of the general government—not against those of local governments." In the Gitlow v. New York, 268 U.S. 652, (1925) case, the Supreme Court ruled that the Fourteenth Amendment, which had been adopted in 1868, could make certain applications of the Bill of Rights applicable to the states. However, the Gitlow case stated (p. 666): "For present purposes we may and do presume that freedom of speech and of the press — which are protected by the First Amendment from abridgment by Congress — are among the fundamental personal rights and 'liberties' protected by the due process clause of the Fourteenth Amendment from impairment by the States." However at p. 668, the Court held: "It does not protect publications prompting the overthrow of government by force", which Gitlow and associates advocated in their publications. The Supreme Court has cited Gitlow v. New York as precedent for a series of decisions that made most, but not all, of the provisions of the Bill of Rights restrictions applicable to the states under the doctrine of selective incorporation. When first adopted, the Bill of Rights applied to white men and excluded most Americans. Free blacks were excluded from The Bill of Rights because they were not citizens. Also excluded were all women, American Indians, immigrants, and white men who did not own land. In 1941, President Franklin D. Roosevelt declared December 15 to be Bill of Rights Day, commemorating the 150th anniversary of the ratification of the Bill of Rights. The Bill of Rights is on display at the National Archives and Records Administration, in the Rotunda for the Charters of Freedom. The Rotunda itself was constructed in the 1950s and dedicated in 1952 by President Harry S. Truman, who said, "Only as these documents are reflected in the thoughts and acts of Americans, can they remain symbols of power that can move the world. That power is our faith in human liberty ...."
After fifty years, signs of deterioration in the casing were noted, while the documents themselves appeared to be well preserved: "But if the ink of 1787 was holding its own, the encasements of 1951 were not ... minute crystals and microdroplets of liquid were found on surfaces of the two glass sheets over each document.... The CMS scans confirmed evidence of progressive glass deterioration, which was a major impetus in deciding to re-encase the Charters of Freedom." Accordingly, the casing was updated and the Rotunda rededicated on September 17, 2003. In his dedicatory remarks, two hundred and sixteen years after the close of the Constitutional Convention, President George W. Bush stated, "The true [American] revolution was not to defy one earthly power, but to declare principles that stand above every earthly power—the equality of each person before God, and the responsibility of government to secure the rights of all." In 1991, the Bill of Rights toured the country in honor of its bicentennial, visiting the capitals of all fifty states. ^ a b Adamson, Barry (2008). Freedom of Religion, the First Amendment, and the Supreme Court: How the Court Flunked History. Pelican Publishing. p. 93. ^ a b c "The Bill of Rights: A Brief History". ACLU. March 4, 2002. Retrieved December 10, 2011. A Supreme Court opinion: "Blacks had no rights which the white man was bound to respect." ^ "Legal definition of Civil Rights". Legal-dictionary.thefreedictionary.com. Retrieved December 10, 2011. ^ "Are Women Citizens and People?". Digital.library.upenn.edu. Retrieved December 10, 2011. ^ "University of Chicago Law Review". Litigation-essentials.lexisnexis.com. Retrieved December 10, 2011. ^ Article 1, later paraphrased in the opening sentences of the United States Declaration of Independence. ^ a b c d Lloyd, Gordon. "Introduction to the Constitutional Convention". Retrieved October 6, 2007. ^ Henry, Patrick. ""Against the Federal Constitution." June 5, 1788.". March 10, 2006. ^ "Jefferson's letter to Madison, March 15, 1789.". March 9, 2006. ^ "National Constitution Center: Virginia". Constitutioncenter.org. Retrieved June 4, 2011. ^ a b "On the lack of a Bill of Rights," also known as "Anti-Federalist #84". Retrieved February 28, 2006. Also see: "The Federalist with Letters of Brutus", edited by Terence Ball, Cambridge Texts in the History of Political Thought, pp. 447–453. Excerpt from the writings of "Brutus" probably in the New York Journal, November 1, 1787. ^ a b Calvin C. Jillson (2009). American Government: Political Development and Institutional Change (5th ed.). Taylor & Francis. p. 31. ISBN 978-0-203-88702-8. ^ Bent, Devin. "Constitutional Convention Overview". Retrieved October 6, 2007. ^ National Archives. "Bill of Rights". Retrieved November 21, 2007. ^ Bruns, Roger A.. "A More Perfect Union: The Creation of the U.S. Constitution". Retrieved July 17, 2010. ^ see Jerome Huyler, Locke in America : the moral philosophy of the founding era, Lawrence : University Press of Kansas, (1995), Chapter 8, pp.218–250; also pp. 275–9. For "many scholars"' discussion of economic rights and the Amendments, see p. 277. ^ a b "Text of Madison's speech, at the James Madison Center". Archived from the original on March 6, 2005. Retrieved February 28, 2006. ^ a b Hamilton, Alexander. Federalist Papers, #84. "On opposition to a Bill of Rights.". Retrieved February 28, 2006. ^ "The Bill of Rights". Earlyamerica.com. February 27, 2007. Retrieved May 15, 2010. ^ Bernstein, Richard B. "Ratification of the Constitution." "The Reader's Companion to American History". Retrieved February 28, 2006. ^ NARA. "National Archives Article on the Entire Constitutional Convention". Retrieved December 16, 2007. ^ Maier, Pauline. op. cit. p. 54-58. ^ Maier, Pauline. op. cit. p. 134, Connecticut expanded electorate to add all town meeting voters; p.140, Massachusetts dropped property requirements; p.218, New Hampshire dropped some property requirements, and added town delegates; p.223, Rhode Island put the question to a referendum which rejected the ratification convention, the Federalist minority centered in Newport and Providence boycotted the election; p.228, Virginia dropped "legal and Constitutional requirements" to expand the freehold electorate; p.327, New York dropped property requirements, timed assembly elections at the same time, and allowed up to five sequential days of voting until the voting rolls were "complete". ^ a b Maier, Pauline. op. cit. p. 431. ^ Maier, Pauline. op. cit. p. 430. ^ WikiSource. "Articles of Confederation". Retrieved July 18, 2009. ^ Maier, Pauline. op. cit. p. 429. ^ Maier, Pauline. op. cit. p. 20. ^ Maier, Pauline. op. cit. p. 438. ^ Maier, Pauline. op. cit. p. 433. ^ Maier, Pauline. op. cit. p. 456. ^ Maier, Pauline. op. cit. p. 464. ^ Maier, Pauline. op. cit. p. 468. ^ "Letter from James Madison to Thomas Jefferson (December 8, 1788)". Teachingamericanhistory.org. Retrieved June 4, 2011. 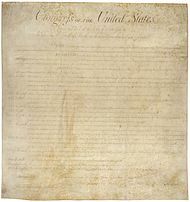 ^ "This uniquely influential document was also used by James Madison in drawing up the Bill of Rights (1789) and by the Marquis de Lafayette in drafting the French Declaration of the Rights of Man (1789). " ^ Findlaw, Amendments to the Constitution of the United States of America. Downloaded April 19, 2010. ^ "Order and Dates of Ratification of the Bill of Rights.". February 28, 2006. ^ "Preamble to the Bill of Rights". March 10, 2006. ^ "Bill of Rights Transcript". Archives.gov. Retrieved May 15, 2010. ^ a b c "The U.S. Marshals Service Takes Possession of North Carolina's Copy of the Bill of Rights". U.S. Marshals Service. Retrieved July 28, 2008. ^ a b c d e f g Frieden, Terry (March 19, 2003). "FBI recovers original copy of Bill of Rights". CNN. Retrieved April 25, 2008. ^ "Bill of Rights". The State of Delaware. Retrieved April 25, 2008. ^ "Documentary treasures: Bill of Rights". State of New Jersey. 2003-2004. Retrieved April 25, 2008. ^ "The New York Ratification of the Bill of Rights". U.S. National Archives and Records Administration. Retrieved April 25, 2008. ^ a b "Background on the Bill of Rights and the New York Ratification of the Bill of Rights". U.S. National Archives and Records Administration. 2007. Retrieved July 28, 2008. ^ a b c "Bill of Rights Returns Home". North Carolina Office of Archives and History. 2005. Retrieved April 25, 2008. ^ "Bill of Rights". The Library of Virginia. Retrieved August 7, 2008. ^ Bent, Devin. "James Madison proposes Bill of Rights.". Archived from the original on March 20, 2005. Retrieved February 28, 2006. ^ "Dread the Dred Scott Reference". Davekopel.com. Retrieved December 10, 2011. ^ "American Treasures of the Library of Congress". March 13, 2006. ^ "Truman's Remarks in the Rotunda, December 1952". March 14, 2006. ^ Mary Lynn Ritzenthaler and Catherine Nicholson, "A New Era Begins for the Charters of Freedom.". March 14, 2006. Prologue, Fall 2003. ^ "Remarks by President George W. Bush at the Rededication of the National Archives.". March 14, 2006. Brant, Irving (1965). The Bill of Rights: Its Origin and Meaning Indianapolis: Bobbs-Merrill. 567 pp. Krull, Kathleen (1999). A Kid's Guide to America's Bill of Rights HarperCollins. 224 pp. ISBN 0-380-97497-5. Richard E. Labunski (2006). James Madison and the struggle for the Bill of Rights. Oxford University Press US. ISBN 978-0-19-518105-0. Schwartz, Bernard; Roots of the Bill of Rights, New York : Chelsea House : distributed by Scribner, 1980. Five volume paperback edition of the two volume The Bill of Rights: a Documentary History, published by Chelsea House in 1971. Spaeth, Harold J.; and Smith, Edward C. (1991). HarperCollins College Outline: The Constitution of the United States (13th ed.). New York: HarperCollins. ISBN 0-06-467105-4. For Know-It-Alls (January 2008). The United States Bill of Rights for Know-It-Alls. Filiquarian Publishing, LLC.. ISBN 978-1-59986-225-5. Retrieved June 3, 2011. David J. Bodenhamer; James W. Ely (May 2008). The Bill of Rights in modern America. Indiana University Press. ISBN 978-0-253-21991-6. Bernard Schwartz (January 1, 1992). The great rights of mankind: a history of the American Bill of Rights. Rowman & Littlefield. ISBN 978-0-945612-28-5. Rich Smith (July 2, 2007). The Bill of Rights: Defining Our Freedoms. ABDO. ISBN 978-1-59928-913-7. Nancy L. Stair (January 2003). The Bill of Rights: a primary source investigation into the first ten amendments of the Constitution. The Rosen Publishing Group. p. 53. ISBN 978-0-8239-3800-1. David Andrew Schultz (May 2009). Encyclopedia of the United States Constitution. Infobase Publishing. p. 59. ISBN 978-0-8160-6763-3. Charles E. Pederson (January 1, 2010). The U.S. Constitution & Bill of Rights. ABDO. p. 57. ISBN 978-1-60453-948-6. This page was last modified on 10 February 2013 at 12:24.